Monday afternoon I rented time on the long arm and quilted this little quilt. After washing it measures about 39″ square. 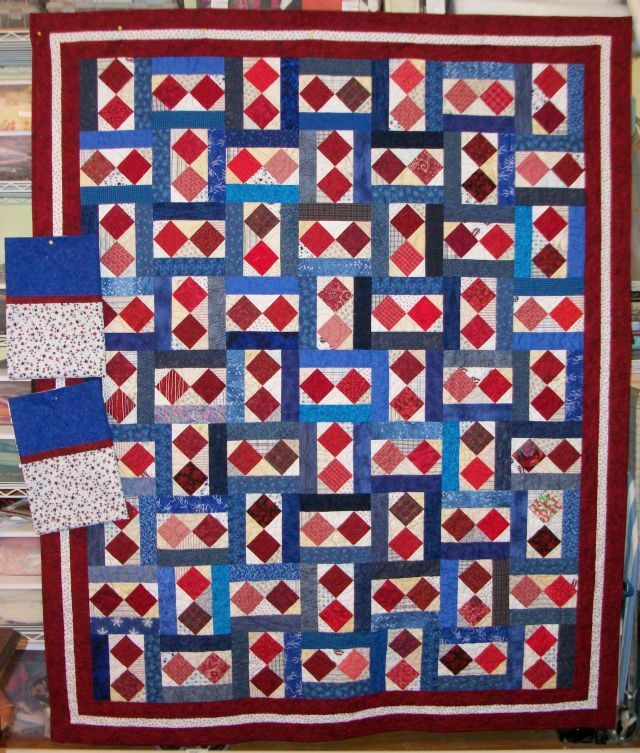 The pieced blocks were part of a Thangles BOM that I started in 2008. I only used 5 of the 12 blocks because I didn’t think all 12 of them went together well. Another 5 are in another quilt and there are two which I suspect will end up in the orphan block box. The batting is Hobbs Bleached Tuscany. I used Superior’s Omni Thread in Verbena on the top and a lavender pre-wound bobbin in the bottom. 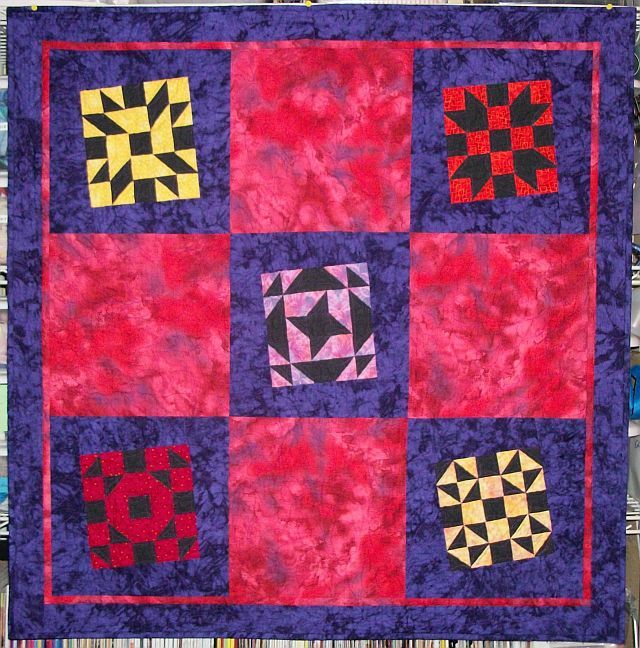 For quilting, I did a “feathery” fill in the red squares, 1/2 feathers and echo around the pieced blocks, curved outlining of the black pieces in the blocks and attempted a circular filler in the borders. I found a printed plaid in my stash that worked well for the backing. 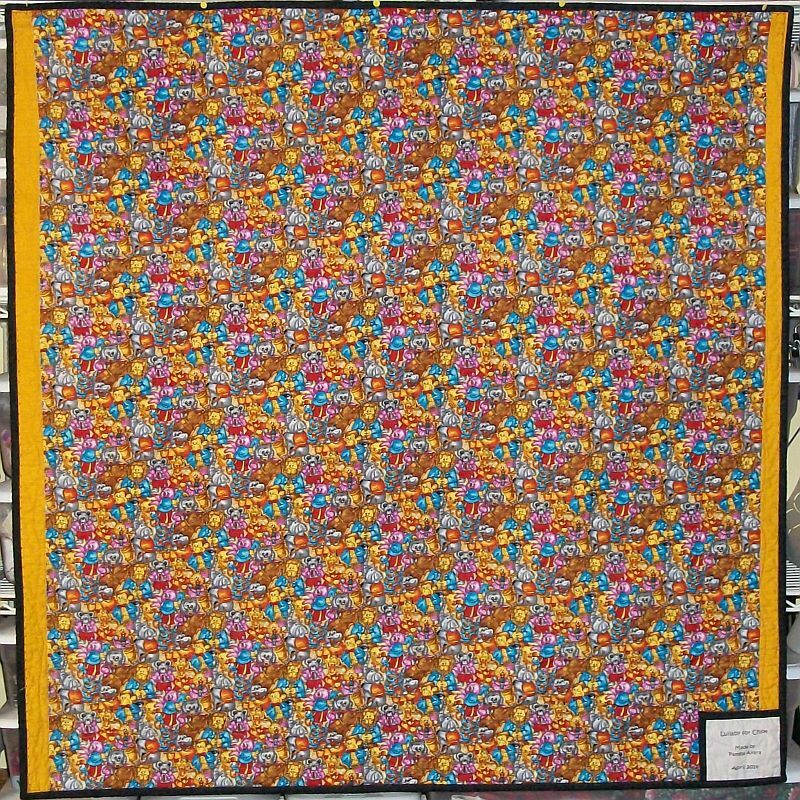 This quilt is on several of my UFO goal lists for the year, including the 2014 Finish Along sponsored by The Littlest Thistle. I’ll update the link when I link up. I’ve finished the Scrappy Irish Chain. I used the pattern from Bonnie Hunter’s Adventures in Leaders and Enders. The 4 patches were done as leaders/enders — but for two other quilts that I decided I wanted a different look to. So, I repurposed the 4-patches, found a length of background fabric and completed the quilt top. It had to age before it was ready to be a quilt. 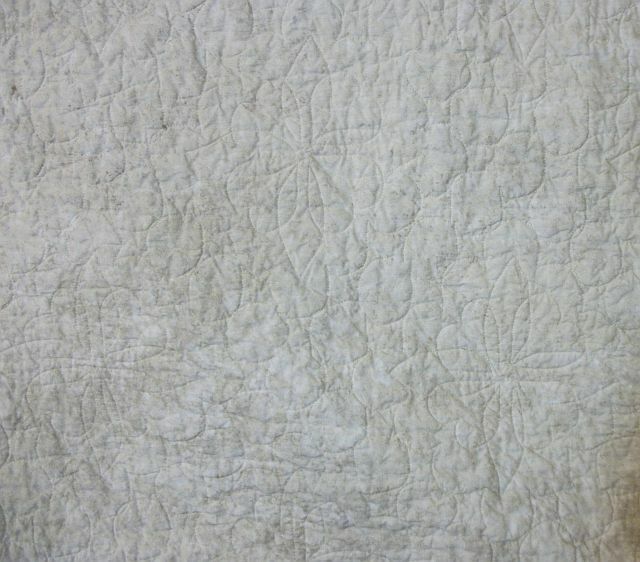 Quilted on a rented Nolting long arm – I can’t remember which one. Made a pillowcase to go with it from the backing and binding. This evening I was sidetracked to make this relatively quick project. 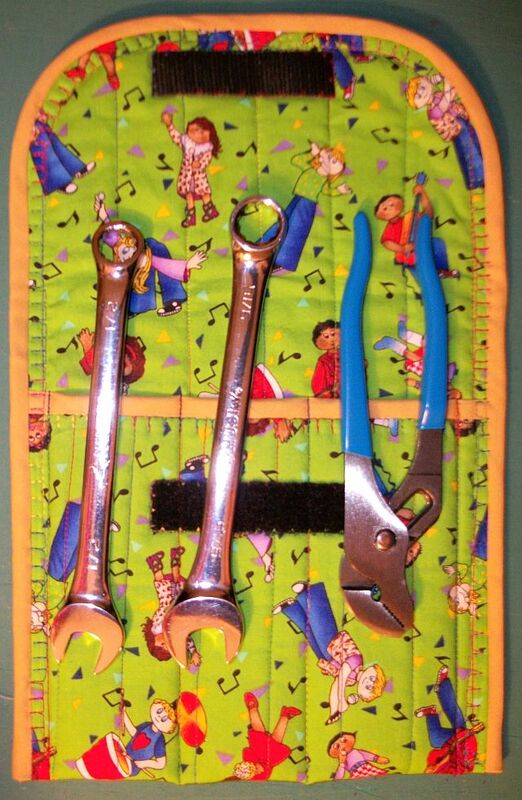 While we were out tonight, my husband bought some tools he could carry in his briefcase to tighten music stands at school. He needed something to contain them and protect the other stuff in his brief case. 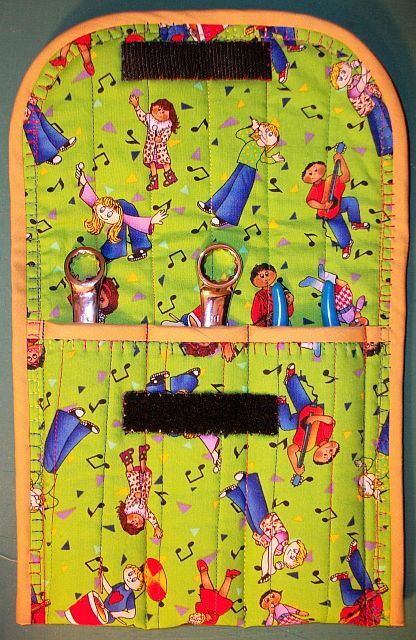 With a piece of stash music fabric, scrap batting, pre-made wide bias tape, and sticky hook and loop tape, I whipped up this custom pouch. Sticky hook and loop tape is not one of my favorite notions – but it was what I had and it made positioning the piece on the flap easy. Now I need to make a case for his batons and cute little 1/32 size bow he carries around for demonstrating bow holds. But that will be later. Right now I have to get back to the baby quilt. The border decision has been made and I have some embroidery to do. Quilted, bound, label, washed, cases made and into the mail. OK, it won’t arrive on Friday, but I gave it my best shot. This is the weirdly titled “August C”. The goal was to get it finished and to UPS by 8 PM Wednesday evening. 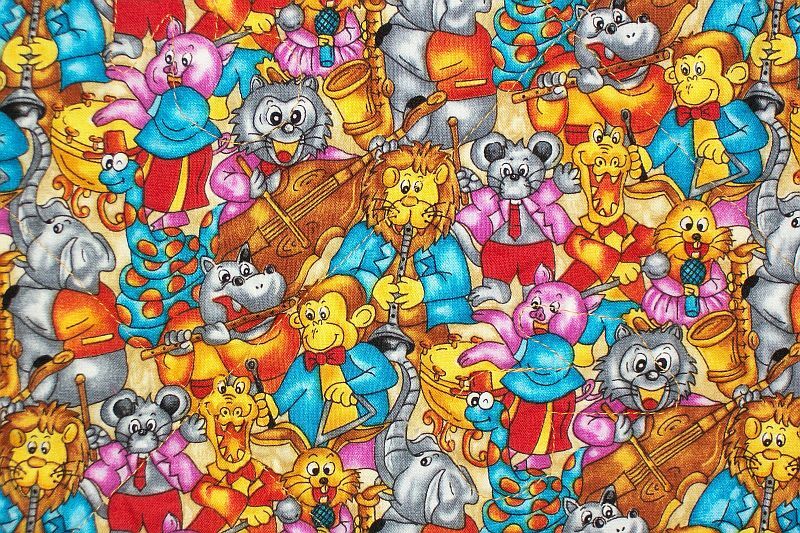 About 7 o’clock I realized that wasn’t going to happen, so I ran over to Jo-Ann’s to get fabric for a couple of pillowcases. 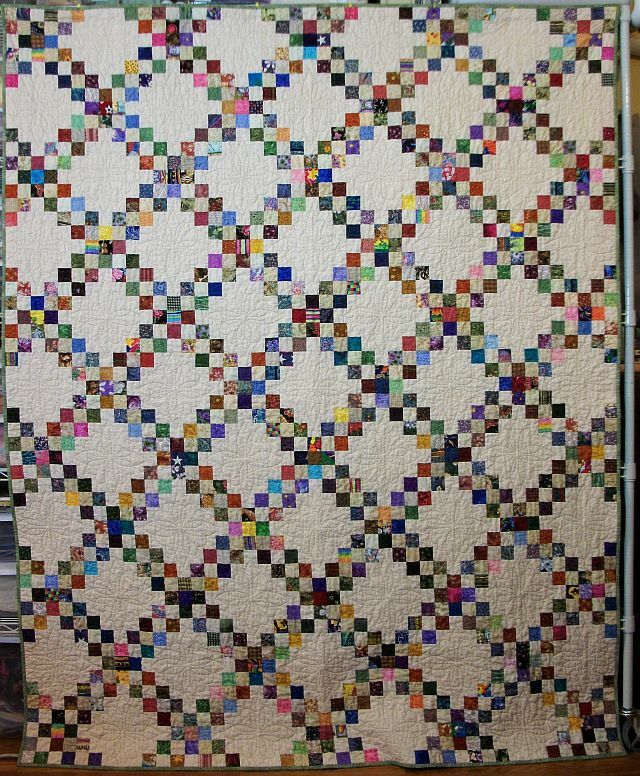 The quilt measured 66″ x 82″ before it was washed. In my haste, I only got the width after washing 63″. The batting is Warm & Natural. 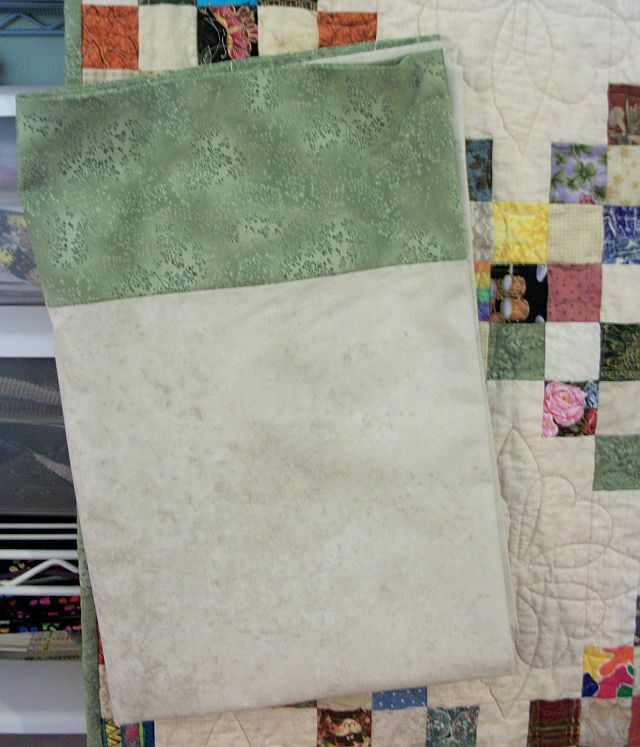 The quilting is “A Little Bit of Fluff” using King Tut Cinnaberry — a red variegated thread. It took just over 2 pre-wound bobbins. Getting this quilt done was not on my list for the year, but it is on the UFO list so all is good. It’s not too bad — but then I had just dumped a bunch of stuff on the floor so I could play with some fabric. It’s a flat surface, so what can I say, we come into the house from the garage and dump everything here. I recently cleared the guest sewing table and ironing board by dumping everything on to my cutting table. When I need to cut something I pull out a mat and put it on the ironing board. 4 – My sewing table. Ignore the open binder. That’s a rolling cart with a work binder on it. The pile of stuff on the right is a combination of personal and work papers I haven’t needed in a while. Mixed in are parts and pieces of at least one quilt, and a windbreaker. So what did I do instead of clearing these flat surfaces? Made the pillowcase to go with No Blue Geese in my Tropical Garden. It should count toward cleaning up – the fabric needed to be put up and I needed a pillowcase. Actually, I’m working on the areas and have made progress on three of the areas. Look for pictures either later tonight or tomorrow. Early this morning (2 AM?) I finished sewing down the binding on No Blue Geese in my Tropical Garden. I used the pattern Geese in my Garden by Mary Honas. My quilt name reflects that there is no blue in the quilt top. At the time I started this quilt it seemed like every quilt I made had blue in it. 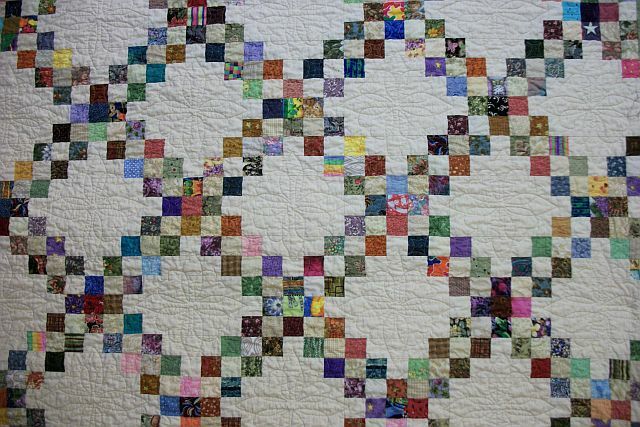 Last month I took it down to Rocking Chair Quilts and rented time on their HQ16. I loaded the top in sideways so I would have a good run for the feathers I did down the print and black strips. The quilting is not award winning. At the time, I thought it horrible. But once it was off the frame and washed, it’s not bad — still won’t win any awards. The feathers in the top and bottom strip were done starting and stopping as I rolled the quilt up. I obviously need to practice more with that concept. Here are a few detail pictures. You should be able to click on them to see them larger. It measures approximately 58 x 80. Now to send an e-mail to Finn and let her know I have another finish for the year! This is my Red, White & Blue Chain of Stars. 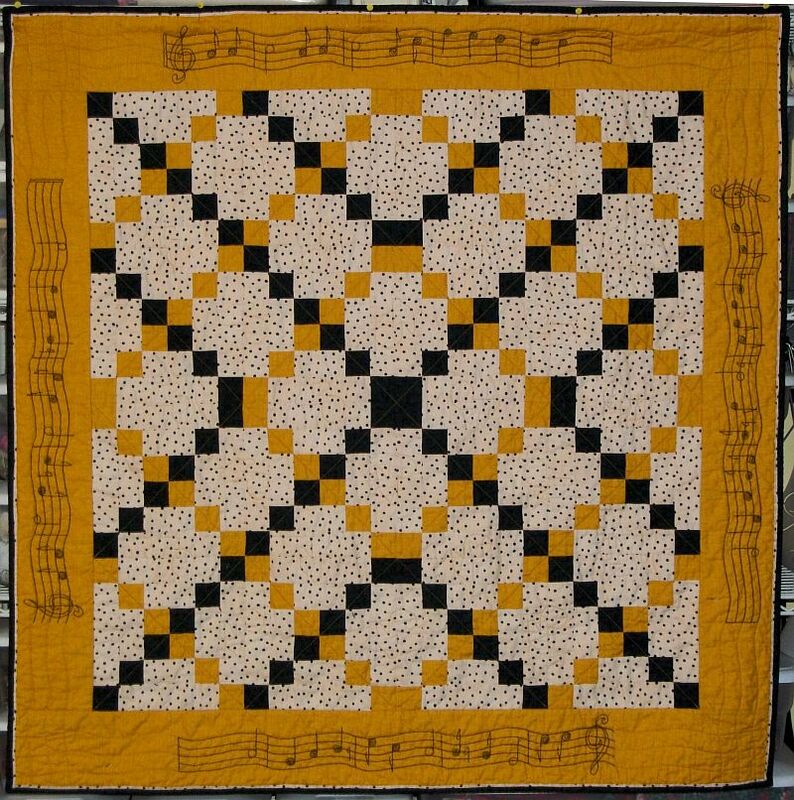 Started in 2007, this was the first mystery quilt pattern I wrote. 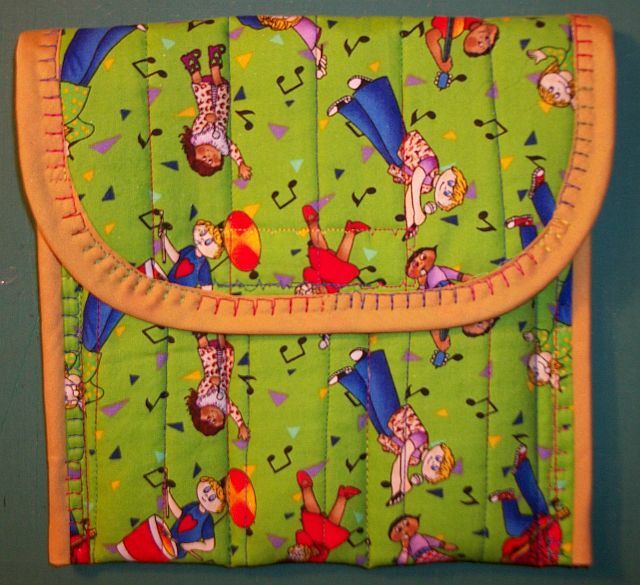 I did this scrappy version and a version in Pink & Black using just three fabrics. The photo is not great, but if tomorrow is as pretty as today was, I’ll take it outside to see if I can get a better picture. 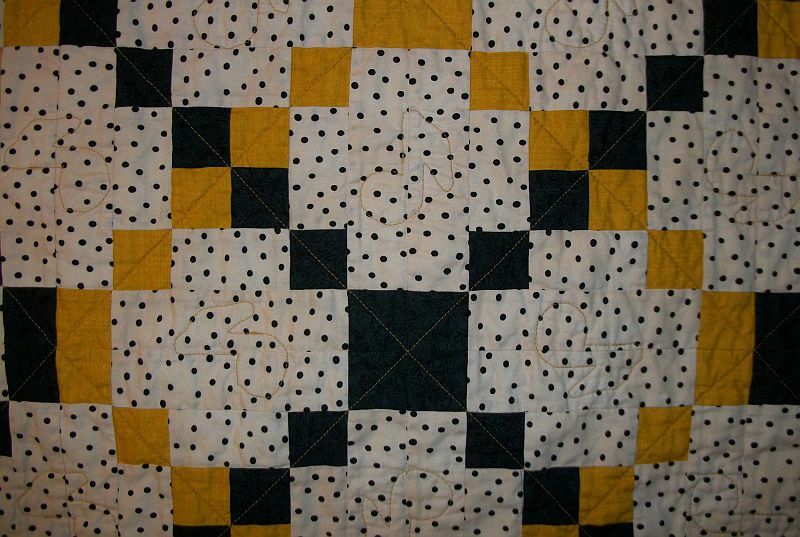 It is quilted with basic straight line quilting on the diagonal, through the blue chains and diagonal sides of the star points. This extends to the red border. Stitch in the ditch between the red and beige border and then curved stitching in the red border reminiscent of bunting. At least that’s what I was trying to do. I used my favorite khaki thread for the quilting. 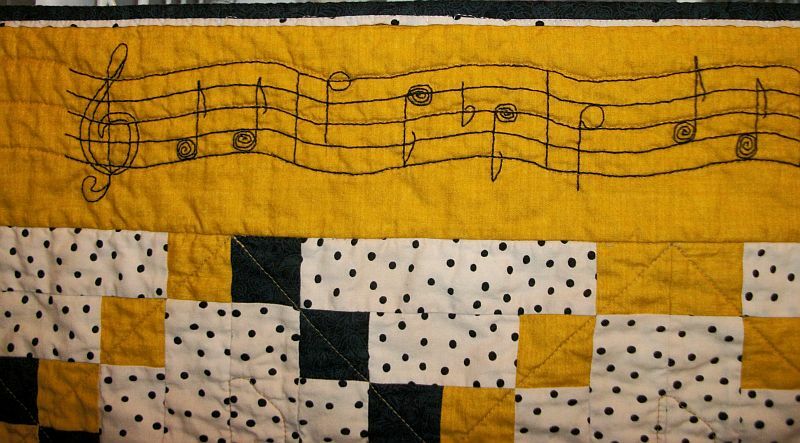 The quilt measures approximately 62 x 79 and there are two matching pillow cases. Although this is not one of the three UFOs I plan on finishing for Finn’s New Year’s Eve UFO Challenge, it was a UFO. Tonight, because I clearly don’t have any projects to finish, I dug through my stash and found a couple of fabrics to make this little bag. I used Karen West’s pattern A Little Duffle Do It, available at www.lovethefabric.com or your local quilt shop. 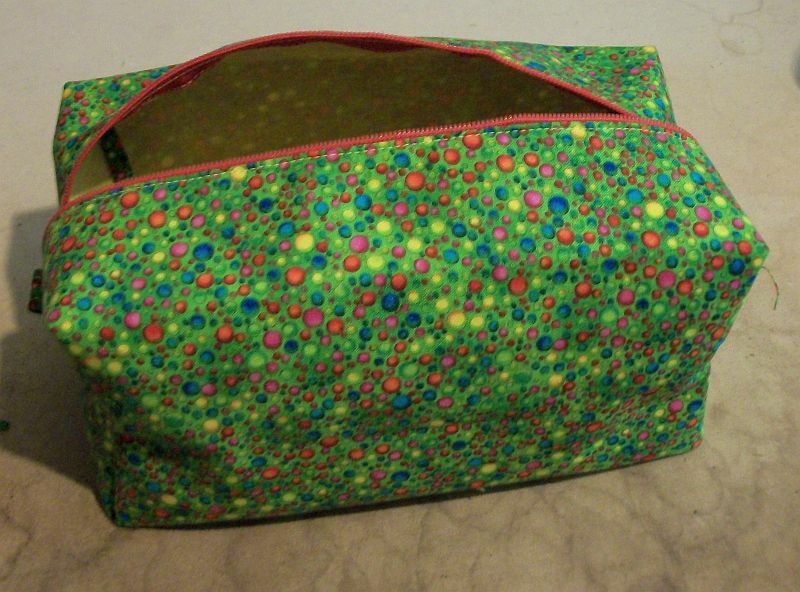 The pattern calls for a 20″ zipper on the large bag, but I only had a 14″ zipper. 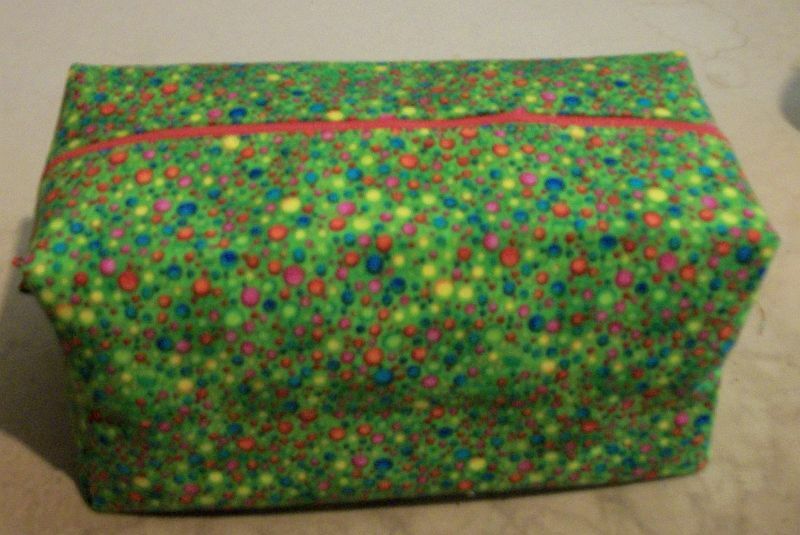 I made it work, but I definitely see where the longer zipper would make things easier. The Row Quilt is Finished! Last week I prepped the binding so I could start putting it on when I got home from Butler Sunday afternoon. I took a nap when I got back, so I only got the binding attached. I finished sewing it down (on the machine) during my lunch break, then tossed it into the wash. I pulled it out of the dryer as I was leaving for quilt guild (what an amazing program by Sally Collins — I think I want to do a small/miniature quilt now). This evening, just before I lost all daylight, I had my husband hang the quilt on the gutters — I’m no longer allowed to do this since I fell off the ladder in the spring cleaning the gutters. Cross a UFO from 2005 off my list!